LG gas dryer flame won't stay lit. I've had this LG DLG3788W dryer 2 years: it stopped heating. Flame lights for 5-10 seconds, then goes out. If interrupted, it usually doesn't re-light. I did some cursory testing & things checked out. Igniter glows. I replaced the flame sensor. Same problem. Bought a new controller board. Nothing changed. Called a local appliance repair guy: after telling him what I'd done, he said "bad thermistors" and ordered them. He said "normal fix" would be to 'replace flame sensor', then 'controller board', then 'thermistors' (in otherwords, NO DIAGNOSTIC TESTING- replace parts 'til the problem goes away, except YOU pay for the "good" parts he replaced.) He put in 2 thermistors (3 weeks later), tried it out and it worked...until he left! (I wasn't home to see it run for a length of time). $200 later (plus the $180 I invested on my own), it still behaves the same! (P.S., No, I'm NOT calling HIM back!!). I tore into it again: checked gas valves- they tested OK. I notice 'valve 2' gets the 90vDC for 5-10 seconds, then drops to zero & flame goes out. I bi-passed the thermistors; same symptoms. Checked voltage from the motor's centrifugal clutch switch & it's OK, too. I'm running out of parts to test (or replace)!! The (miserable) schematic isn't very descriptive, and is totally void of any functions done by the controller board, making troubleshooting a real task. All wire harnesses test OK, too. By the by, I DID send a "comments" to LG telling them of what I think of their dryer: I gave them a "one star" rating, saying that I did that only because there were no "zero stars"...! I have yet to see my response printed on their web-site. Anyone have any suggestions to try??? Thanks! The Mad Scientist. Re: LG gas dryer flame won't stay lit. Before you go off on LG, take the vent hose completely off the dryer and see if this does the same thing. Your hi-limit thermostat may be defective if the problem persists. Naturally, we don't run the dryer with any panels removed or the door open. To "Repair man": Thanks for your suggestion. I did, indeed, have the vent hose disconnected (the dryer, when it DID light, only ran for less than 10 seconds before going out, so the vent being disconnected wasn't a problem). As for the hi-temp thermistor, the appliance repair guy replaced two of them. (The old ones checked 'OK'.) To be on the safe side, I jumpered each of them separately to simulate an "NC" condition: flame would initiate, but drop after 5-10 seconds. If I interrupted the sequence ("pause"), it would not re-light as it should. One would think that the controller board was at fault: I did replace it, too. It would be a stretch to think that the "new" one would have the identical problem as the "old" one. Same with the flame sensor. The mad scientist. If it is not a sensor issue, then something is causing the flame to not travel thru the burner flue correctly. This could be lint trapped in the intake (filter area) or blower problems. You have apparently covered everything else up til now. You say when the flame is "interrupted" it will not re-light. You also say the glow bar comes back on.When the glow bar comes back on,separate the flame sensor wires and see if it ignites. Generally, the flame extinguishes before I push the "interrupt" button; that is, it will generally only stay lit for 5-10 seconds. A few times, it has stayed on (maybe for a total of 30 seconds), at which time I thought "it might be working properly". This was when I "interrupted" it. When it re-started, the igniter came on, but no gas was introduced, therefore no re-light. When it ingites and shuts off (5-10 seconds), I usually push the 'on/off' switch, totally turning the unit off. I will restart it (setting the cycle to "heavy load", which demands the maximum drying capability), "start" the unit and watch: unless I have waited several minutes, the igniter DOES NOT come on. It's as if the flame sensor has to cool down before allowing a re-light. That's why I replaced it. (The replacement didn't cure the problem.) Since it does ignite after a "cold start", the sequence seems to be working. It just terminates after 5-10 seconds! For no apparent reason... The only other possibility (logically thinking) is that some other protection feature is interrupting something on the controller board. There is a 'dry sensor' and 'thermistor' within the blower housing, but a look at the schematic doesn't show it within the 'area of responsibility' for ignition and operation, only to sense completion of fabric dryness. From "jumptrout51", I assume you mean to 'unplug' (your term "separate") the flame sensor wires: the flame sensor is an "NC" switch (according to the schematic), meaning it is required to be in the circuit to "enable' the relay (on the controller board) that lets the sequence (flame 'on') work. I did try jumpering it once: the igniter stayed on, but the gas never came in (I 'interrupted' it after 30 seconds, so I wouldn't burn out the igniter). From "Repair-man", I removed the blower cover and thoroughly cleaned everything out of all channels...inlets, outlets, ducting, vent pipes, lint filters...it was almost cleaner than new! Plus, with the face off and the vent pipe disconnected, there were no restrictions. Yes, I know...frustrating!!! I've tried almost EVERYTHING I could think of...what it's doing makes NO sense. I repair TV's and cars and almost anything else. I'm missing something, but can't figure what! I certainly appreciate the great suggestions! The mad (really!) scientist. The flame sensor does have to cool off. It is heat activated. Hello 1800f degrees? You kidding me? that joker ain't gonna cool back down in 5 seconds. re: J W Webster: Roger that!! I do agree- I sometimes hear a faint "click", indicating something being reset. I can't locate the source of the click, however. (I assume that it IS the flame sensor.) Notwithstanding that, it doesn't account for why the flame shuts off after just a few seconds. As I originally stated, "valve 2" on the gas valve does ramp to 90vDC (after the initial sequence), at which time the flame will ignite, but drops to 0vDC after 5-10 seconds, at which time the flame extinguishes. Therein lies the conundrum...! OK then feel the coils after ignition and the hot one will be the bad one. This sounds like the exact same problem I'm having with a DLG7188WM that is about the same age. Did anyone find the correct diagnosis? I changed the gas valve on mine because when I checked the #1 coil for resistance, if I pushed one direction with the probe one of the coil leads, it read open. If I pushed the probe the other direction, it read the correct resistance. Can't buy just the coil. New valve didn't fix the problem. Called a repair guy, gave him $70 for him to tell me it's the control board, but looks like you did that and it didn't fix the problem. I have a real hard time paying $540 for a part that I'm not sure is bad, on a dryer that I spent extra money to get the good stuff, and 2 years later--it's no good. did you do any tests in the Service Manual ? I pressed and held the power button whild holding the other two buttons as described in the manual (troubleshooting sequence). It went through the test sequence with all lights on the panel lit, and it alternated some code three times(which I believe is correct)--it was UA02 then 8:98, or something like that. Then it displayed nE after that sequence. I stepped through with the pause button as described, and got temps that were accuate (~20 C on both readings). The motor and igniter did what they were supposed to. There was about 100 VDC on valve #1 until about 10 seconds after the flame lit, then it went to 0 VDC after the igniter went off. Valve #2 had 0 VDC until the ignition sequence began, went to 90 VDC and then went to 0 VDC when the voltage to valve #1 went to 0 VDC. I tried the semiconductor test, and one reading said 300 ohm, and the other said 600 ohm. They were both supposed to be 300 ohm. The flame detector said less than one ohm before ignition, and upon flame light, it went open, as it was supposed to. I have a "cooling" light on the panel that is always lit, and never goes out. All of the other functions seem to operate normally. I would feel much better about replacing a $100 board, if that were the problem. Where do I find that? The picture is the link. Thanks! I ordered it Tuesday, and it should be here tomorrow. I went and checked limit switches, semiconductor, and flame sensor--all checked good. One more symptom that showed up--now the burner doesn't light at all, and no voltage at the valves. Igniter got hot, it didn't light the first time. If I let it run, it tried to light a couple more times, but no gas=no flame. I'm hoping the controller is the problem. I don't see what else it could be. IF YOU USE FABRIC SOFTNER THAT WILL MAKE THE SENSOR TRIP!!!!!!! I SPENT ALOT OF TIME FIGURING THAT OUT. IT TAKES ABOUT 3 LOADS TO CLEAR OUT ALL THE SOFTNER THEN IT WILL STOP TRIPPIN. Dryer is now working very nicely, and mama bear is happy. Once I had the new control board installed correctly, front panel and the door in place, and filter washed out with hot water, it lit and stayed lit. Note, even if the filter doesn't look dirty, using fabric softener sheets over time seems to create a film that obstructs flow--hot water is cheap and easy. I'm pretty sure the controller was bad, and I have at least one spare gas valve solenoid now. Mission complete, and it was still less expensive than getting the repair guys out again for the quoted $520 replacement part plus labor. RepairClinic--Thank you very much for your help. I highly recommend RepairClinic and ApplianceJunk for your home appliance repairs. Congrats MD. Can you give me either the item number or the picture of the control board that you replaced.I'm having the same problem.Is it the control board or control panel.Thanks. 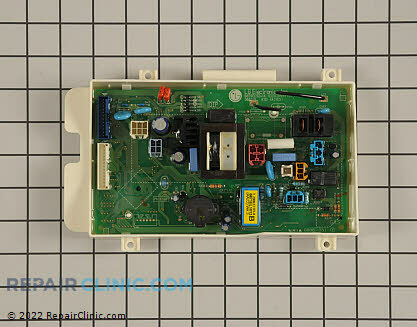 The controller board part number is 1359865 on Appliance Clinic. If you go back to the first page of this thread, down toward the mid-bottom, there is a picture of the board. If you click on the picture, the Appliance Clinic webpage and will pop up. Make sure you check out all of the info in this thread. There was a bit of "shotgunning" here, just because I wanted it done. You have to have the door and panels installed to get the right air flow. And wash out your filter with hot water. Thank you MD. I will give an update after I replace the part.